Love it. So easy to use. I didn't realize what I was missing out on until I bought this food processor. I was spending so much time chopping food when this could do it much faster with the press of a button. I bought the Hamilton Beach food processor on a whim when it was on sale and I had an additional coupon so the price was reasonable and much better priced than other food processors out there. It is small so it can't handle a lot of food, but emptying it out and doing it again is easy. I use it to chop veggies, nuts, and other food. It works great every time and I have had it for years. It is also easy to clean and put back together. I don't use it very often so it sits in the cupboard but since it is small it doesn't take up too much room so I love it! This little chopper works so well for me. I have a family of four and its just the right size for chicken salad sandwiches or salsa. And i use it for shredding cheese 3-4 times a week, so quick and easy. I also like it because you can pop all the parts right into the dishwasher. Power Strong enough for the little guy that it is. Safety You cannot opperate the motor until the cup is locked in and the lid it locked in. Also the chute is long enough that i dont worry about chopping fingers when loading my food. Ease of Assembly Although it is safe, sometime getting the cup and lid lined up to lock in takes patience, it only fits one way and locks one way, and i must be blond because i always do the opposite first. Ease of Cleaning Everything is dishwasher safe. There are no little cracks or crevasses to build up mess. I never feel like it isn't clean, very happy with the clean-ability. Durability I have been using handy prep for two years and it is holding up very well, plastic is still clear, not scuffed or cloudy, attachments are still sharp, and nothing has malfunctioned in any way. This is a handy food processor. I like the small size and the compactness of it. It purees great and I have used it for many things- pesto, baby food, and soups. One compliant I have is since it is small, it takes some extra time to scrape food out and I feel a lot gets left behind. It is easy to clean, and very powerful for its size. There are not many options with this, and now that I am hooked on using it, I wish I bought a larger one with more attachments. However, that is personal preference and if you are working on small scale, this is perfect. 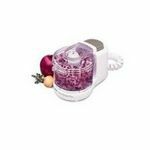 Provides ease of chopping, grating, slicing, and mixing. This is a wonderful addition to my kitchen. The ease with which it operates and works perfectly for all of my chopping, mixing, shredding, and slicing is amazing. I would not exchange it for any other machine. Power Power is strong enough for normal kitchen uses. Safety If instructions are followed it has good safety measures. Ease of Assembly Assembly of this product is a breeze. No fuss, no muss. Ease of Cleaning Cleaning is easy enough, just have to be cautious Durability I believe it is very durable. I have chopped, mixed, grated, and sliced many times and never had any problems. My husband ordered this cuisineart 3 cup food processor through a rewards catalog from his work. Because items in rewards catalogs always seem overpriced (in term of points) and cheap in quality, I really had low expectations for this product. When I got it, I was delightfully surprised to find that the food processor was quite sturdy and heavy duty in feel. It quickly became my best friend in the kitchen. I've made everything from salsa, hummus, tzaziki sauce, baby food purees, ground chicken, ground pork, to hashbrowns, shredded carrots/apples for homemade muffins, etc. Its absolutely wonderful and cuts down on the work, if I have a big cooking/baking project. The only major con is that its not so easy to clean, and, I wonder how long the blades will last before they become dull and I need to replace them (I'm thinking it'll probably cost just as much to replace the blades as it will cost to just buy a new processor). For most jobs, the 3 cup food processor is perfect for my small sized family of 3. 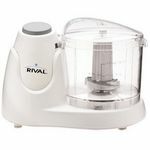 If you've got a bigger family, maybe go with a similar model, but go with at least a 7 cup food processor. I would highly recommend this product to anyone who does a lot of cooking from scratch at home. I bought this Cuinart Processer for my husband for Christmas because he had indicated that he wanted to start making homemade salsa. He started using it right away and has had zero complaints. He likes that he can test things out to make various consistencies. He likes to make a thinner salsa and uses a variety of vegetables. he says this processer handles each food item easily and proceeses them for steady consistency, regardless of what vegetable he is handling. Not all processors have this consistency. 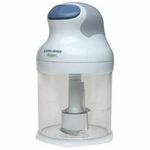 The feature that is best about this processer is that it has mulitple blades for multiple uses/fuctions. This is important in many aspects of cooking because various foods will be distintegrated when processed. I also like the size of it as it fits nicely under our cabinet since we do not use it every day. It is a very sleek machine and must be easy to clean because I have not had to clean its parts even once! I know that many of the pieces come apart easily so that each piece can be adequately cleaned and then put away quickly. 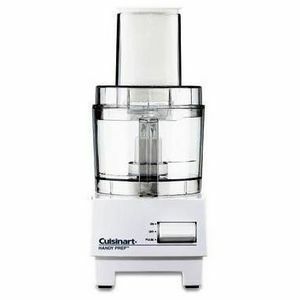 The Cuisinart DFP-3 Handy Prep 3 cup food processor is the best on the market. Its small but compact but the power that this has is awesome. It is perfect for a single person or for a small family. I have used mine for making homemade salsa and chopping veggies. I have also made baby food with it. The baby food comes out nice and smooth. I also like the pulse button so I can control how much I want to choo but also like that you can just turn it on and let it run if I am making sauces or gravys. It also chops up ice pretty good. I like to make mocha frappe at night ( alot less calories and just as good) and I can whipped them up in a jiffy with this machine. Cleanup is easy with the Cuisinart handy prep food processer too. No hard to clean places on it. the blade comes out easy for cleanup too. My oldest daughter borrows it all the time so I have decided to get her one as a christmas gift. Use this Cuisinart product often. 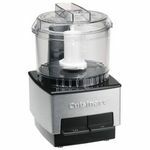 Cuisinart mini prep processor. I purchased this to replace the one I had that broke. These are an excellent purchase for people who are making things for one or two. These are handy and convient to use. This machine has changed my kitchen in a good way. I don't know many people who enjoy cutting vegetables when they could be on to the magic of cooking. I'm certainly not one of those people who like cutting an onion into tiny pieces, nor am I good enough with a knife to do it quickly. That's why I wanted a food processor. I admit, I didn't do a lot of research when I bought this one. 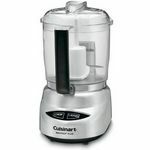 I read a few reviews, though, and found that while a lot of people loved the Cuisinart Handy Prep, a lot of people disliked it.Comments ranged from the smallish capacity to its ability to discolor. I was nervous about these things when I bought it, but I shouldn't have been.The Handy Prep comes with a chute that allows continuous grating or slicing. I've found that it's a little hard to get the bowl exactly under the chute, due to the fact that it is low, and I never have a bowl that is shallow enough. Other than that, I have no problems with the continuous action features.The discoloration factor is merely cosmetic. I usually let the orange or pink color remain after washing until it gets used again, and after it is handwashed a second time, the color is gone. I wouldn't worry about something so cosmetic anyway, since it doesn't take away from the real beauty of the machine - the fact that I no longer have to chop so often!I'd say the biggest con is that it can be a little tricky to wash. I suppose if it is machine washable others might take that route, but I don't use a dishwasher, so I wouldn't even know if its machine washable.